"Olsen, still Olsen, brilliantly done! Jesper Olsen! A goal of supreme quality!" "Olsen... Oh that's very loose... and Jesper Olsen puts his head in his hands, made to pay for over-confidence." Before the PlayStation, there was Denmark. Impossibly stylish, improbably cool, imperfectly real. If the 1970s were brilliant Oranje, the 1980s were red and white; Danish Dynamite. Even their kit had a pinstripe. "Expectations were not that high for us so every step of the journey was novel and we had fun," says Olsen, the left winger in a side who, like their total-football predecessors, often spurned fixed positions. From their ageless libero Morten Olsen, to the tall and powerful Preben Elkjaer, to the languid Laudrups and dazzling dribblers Olsen and Arnesen, their genius was often a tortuous virtue. Olsen, who fittingly had begun his professional career at Ajax, where he once played a one-two penalty with Johan Cruyff, would in a sense bookend his country's meteoric mid-1980s surge. His goal of "supreme quality", a late equaliser against England, proved decisive in qualifying for Euro '84, where they were denied in a semi-final shoot-out by Spain. "It was disappointing but we were happy just getting to the next stage," says Olsen. "There was never gloom and doom, that is why it was so special. It seemed as if we had an understanding of how we wanted to play the game, even though our players were scattered all over Europe." The team that destroyed Ireland en route to the 1986 World Cup featured champions from Italy, West Germany, England, Holland and Belgium. "We knew most of the Irish boys because they played at an elite level in England," says Olsen. "We'd been on a run, we had a team who were really gelling and were able to win all the important matches. "We had a belief from beating teams like England that we could beat Ireland. It was a compact, intimate stadium in Copenhagen, 45,000, wonderful colour and noise and we hardly ever lost there during that period. It was a fortress. "And then going away, it suited our team to play on the counter. Preben Elkjaer was very fast, Michael Laudrup creating from behind, Allan Simonsen and I breaking. And we always defended equally as well together. We'd a style of play that suited our team." A style that was at once intoxicating but which also walked a tightrope, that threatened self-destruction at any moment. 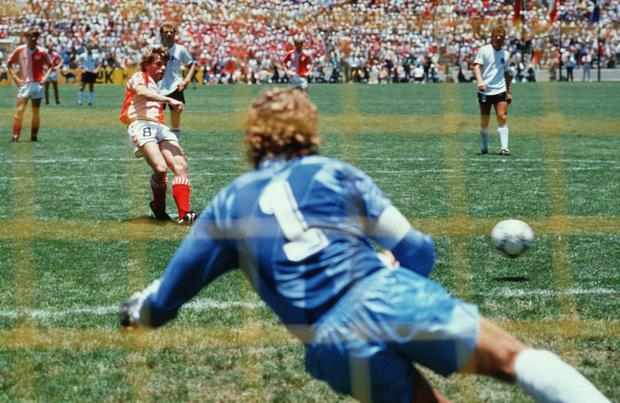 After destroying Uruguay, Olsen's deft spot-kick earned a 2-0 win against West Germany in another attacking tour de force and another penalty against Spain in round two, seemingly, set them up. Only for a fall. The "over-confidence" prompted Olsen to effect a self-destructive back-pass, upon which Emilio Butragueno pounced. Denmark would lose 5-1; days earlier they had won 6-1. It's half a lifetime away yet still Olsen is reminded about it - every time some guys rings his Australian home from half a world away. It typifies this team's character that he regrets nothing. "Of course, anything like that you play it over in your head. You can't change it but only ask why did it happen? "Even though we were still only 1-1, it was the catalyst of our demise. I played on the right side instead of the left but I would have done exactly the same thing again. "It just left my foot a little bit differently than normal. I do a lot of public speaking now and you take it with you and learn from it. It was a learning curve for me. "It was a good thing for me personally, it was my first real setback. I don't see it as a bad thing. I'd love to change it but I can't." At Euro '88, the team were a fading force; like France and Russia, the colour was slowly draining from the beautiful game these countries played. The pollution of Italia '90 was followed, ironically, by Denmark's only major tournament success when they came off the beach but somehow their bland brand of anti-football seized the depressing day. Even Michael Laudrup had decided to walk away rather than take the chance of winning a medal within such an artless ensemble. Sadly, Olsen's career had ended by then through injury. "In 1992 it was a completely different team and they took their chance. It was a fantastic story considering they were on holiday. "We were remembered for putting Denmark on the map. We had an unbelievable team and had so much fun. It was nice the country did eventually win something. They deserved it." Olsen, now 56, lives in Melbourne and works, aptly, at the Fun Football Academy; he appreciates what he has, not what he has not. An especially keen philosophy when you know you could have lost it all, as he can readily testify. "I was out jogging one day and it was like someone knifed me in the head or neck," he recalls of the 2006 morning when he suffered a brain haemorrhage. "Basically there was a burst blood vessel outside my brain and if it didn't stop I would have died. I got to a hospital and thankfully it did stop. It puts things in perspective."